Polished 14kt yellow gold. 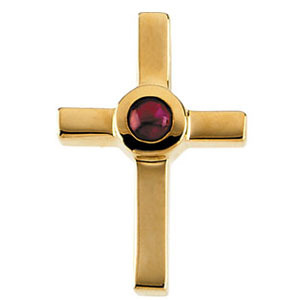 Cross pendant with hidden bail. Round ruby is AA quality, 3mm in diameter. Dimensions: 17.75x10mm. This item is the size of a dime. Weighs 1.12 DWT (1.74 grams). Please note: weight is approximate, actual weight may vary.